Bek Ohmsford was the brother of Grianne Ohmsford. Dark brown hair and startling blue eyes, similar to Grianne’s. Small and wiry. Agile, speedy and surprisingly strong. Bek Ohmsford was careful with his words and temperament. Five years younger than Quentin Leah. Felt protective towards Quentin, even though Quentin was older and he considered the matter reversed. Lived in Jentsen Close with his parents and sister, Grianne. The Morgawr led a band of Mwellrets in an attack on his home in which his parents and family dog, Bark, were killed and the house burnt to the ground. He survived only when Grianne hid him in a cold room off the cellar and later told her kidnappers that he was dead. Truls Rohk found him three days later, almost dead, and took him to Walker Boh. When Bek was strong enough Walker took Bek to Coran Leah‘s home to live, telling him that Bek was the son of Holm Rowe. Grew up known as Bek Rowe as his father was believed to be Holm Rowe. Bek remembered his father only as a shadowy figure with a dark strong face. It was generally believed that, knowing he was dying, Holm brought Bek to Coran as there were no other relatives. Before leaving with Walker Boh, Coran Leah advised him it was actually Walker who had brought Bek to the Leah family, not Holm Rowe. Walker had told Coran that Holm had died in an accident, leaving Bek alone, and asked him to look after him. Coran checked up about Holm at a later date but could not find anything out, causing him to doubt Walker’s story and whether Holm actually was Bek’s father. In between Mephitic and Ice Henge Walker revealed to Bek that he was neither a Leah nor a Rowe. His name was Ohmsford and he was descended from Brin Ohmsford. This meant that Bek and Walker were also distantly related. Bek’s real father, Araden Ohmsford, was the then last direct descendant of Par Ohmsford. 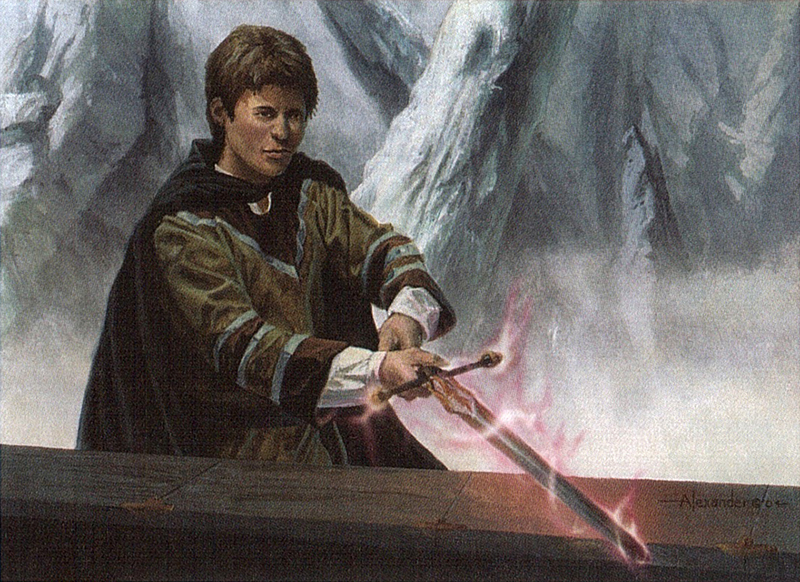 After Walker had told him the truth about his childhood, he also revealed to him the Sword of Shannara was aboard with them, and that it now belonged to him. Walker believed the sword was the key to entering Ice Henge. Bek then knew himself to be Bek Ohmsford, but had to keep it to himself, along with the knowledge of the Sword of Shannara and his magic. Bek was given lessons on how to fly the Jerle Shannara by its captain Redden Alt Mer. Bek and Rue Meridian moved to Patch Run where the family ran an airship service that flew expeditions to remote areas of the Four Lands. Was given the Phoenix Stone by the King of the Silver River when he left the Highlands in search of Truls Rohk, but gave it to Ahren Elessedil before he had a chance to use it. Although he did not realise what it was at the time, Truls Rohk had him use the Wishsong the night they obtained the third key from Mephitic. He used it again at Castledown to kill the Creepers attacking them and he and his companions lives were in danger. This time though he got lost in the magic, killing the Creepers without remorse and crying out in triumph, until Ryer Ord Star managed to get through to him and get him to stop. He was unable to understand her reaction of horror and disbelief at his actions, believing that all he had done was save them. Bek first used the Sword of Shannara to guide the Jerle Shannara through the Squirm. This experience strengthened him in ways he could not define and made him feel reborn after the confusion and self-doubt he had been feeling throughout this journey.